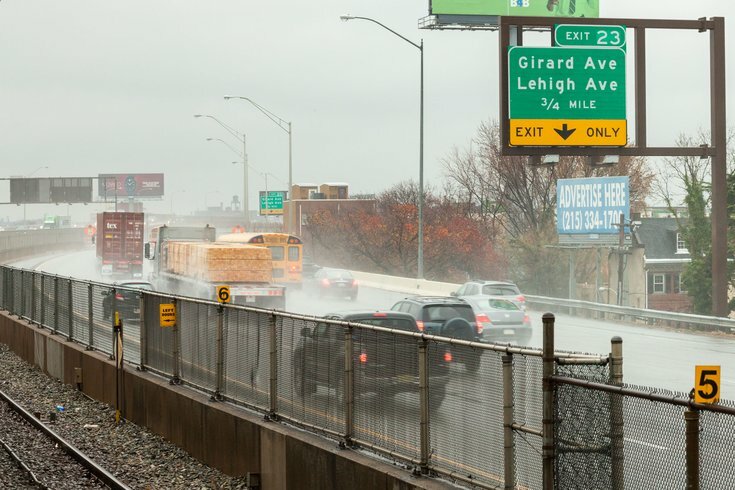 Northbound traffic travels on I-95 in March 2015. A low-pressure system off the Jersey coast is spreading rain across the region. The latest forecast seems to preclude any snow for the Philadelphia region. Forecasters had been uncertain whether enough cold air will be drawn from the north to eventually change the rain to snow. The storm, which has prompted a high wind warning and flood watch for the region, will be strongest in the Poconos and northern New Jersey, where there is a potential for blizzard conditions on Saturday. A high wind warning, upgraded from a watch, is in effect through 6 a.m. Saturday for the entire region, forecasters said. Northwest winds from 25 to 40 mph with gusts of 40 to 50 mph will develop toward midday Friday. Peak gusts to 60 mph are most likely to occur from mid afternoon to late evening Friday. Winds will gradually diminish late Friday night. With the ground saturated, there is the potential for high winds to blow down trees and power lines. Scattered power outages are likely, forecasters warned. Travel will be difficult, especially for high profile vehicles. The flood watch is in effect across the region from late Thursday night until late Friday night. The rain is expected to persist through Friday and perhaps into the night. Low-lying and poor drainage flooding is likely where the heaviest rain occurs. Flooding is possible Friday night into Saturday with runoff into larger streams and rivers, according to forecasters. Between one and two inches of rain is likely in Southeastern Pennsylvania and South Jersey. The rain is expected to change to snow in the elevated terrain of the Poconos late Thursday night, with a couple inches of snow possible by daybreak. The easterly wind is expected to become north, then northwest overnight. Low temperatures are anticipated to fall into the 30s in the Poconos and in far northern New Jersey, and into the lower 40s for points south. Significant forecast changes are possible in the next 12 hours for Friday and Friday night. Meanwhile, models are suggesting increased potential for another major coastal storm by the middle of next week, with possibly heavy rain, strong winds and coastal flooding, forecasters said. Thursday night: Rain. Low around 40. East wind 5 to 9 mph becoming light and variable after midnight. Chance of precipitation is 100 percent. New precipitation amounts between a half and three quarters of an inch possible. Friday: Rain. High near 45. Windy, with a northwest wind 8 to 18 mph increasing to 21 to 31 mph in the afternoon. Winds could gust as high as 55 mph. Chance of precipitation is 90 percent. New precipitation amounts between a quarter and half of an inch possible. Friday night: Rain and snow likely before 2 a.m., then a slight chance of snow. Cloudy, with a low around 35. Windy, with a north wind 24 to 30 mph, with gusts as high as 55 mph. Chance of precipitation is 70 percent. Little or no snow accumulation expected. Saturday: Partly sunny, with a high near 47. North wind around 18 mph, with gusts as high as 33 mph. Saturday night: Mostly cloudy, with a low around 34. North wind 13 to 16 mph. Sunday: Mostly sunny, with a high near 47. Sunday night: Mostly clear, with a low around 31. Monday night: Mostly clear, with a low around 32. Tuesday: A chance of rain after 1 p.m. Partly sunny, with a high near 48. Chance of precipitation is 30 percent. Tuesday night: A chance of rain. Mostly cloudy, with a low around 37. Chance of precipitation is 50 percent. Wednesday: A chance of rain. Mostly cloudy, with a high near 45. Chance of precipitation is 50 percent. Wednesday night: A chance of rain. Mostly cloudy, with a low around 34. Chance of precipitation is 30 percent. Thursday: A chance of rain and snow. Partly sunny, with a high near 45. Chance of precipitation is 40 percent.